We wish you all good fortune! 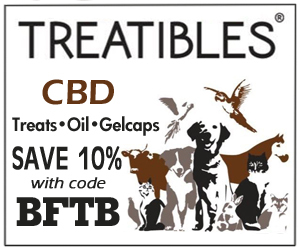 As an affiliate for Treatibles, if you use my discount code, I will receive a small commission. I believe in the all-natural power of CBDs. you’ll be a believer too! Those are not good fortune letters! BOL! 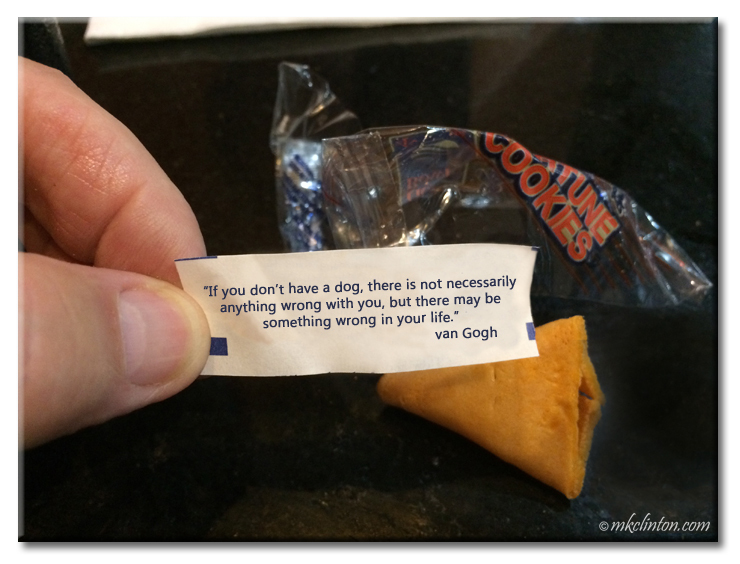 The best fortune! I hope you and Pierre got a tiny piece of that fortune cookie, Bentley! We did not and now realize that we were ripped off! That is a perfect and very true fortune! Love it! Now, if only the winning numbers are really winners so we can have the lottery! What a great fortune, so true! Happy WW! We can't imagine any life without a dog. It would be a dismal existence for sure! That Van Gogh was a pretty clever fella as well as a talented artist. Life is definitely better with a dog. He was and obviously had very good taste in friends. LOL! We were "dogless" from May 2012-April 2013. It was so sad. I cried every day. I had a dog in my life consistently from 1969-2012. So...it was 43 years of one or more dogs every day. We had cats, but...yes...a dog completes the family. It just does. HUGS! I can't remember a time when we didn't have at least one dog or cat. It would be so sad not to have a furry best friend. Van Gogh: wonder if the Doodz know how wise he was even w/o an ear. I don't think he had any idea how wise or talented he was. That's best fortune cookie ever! We agree although Mom ate it and did not bring us even a crumb! That sounds like a great fortune! Has another dog followed you home?? That was one smart cookie!! Ain't it the truth?! LOL! It is strange that we always get a different breed of dog each time we have to say good-bye to one. I guess it is because I never want to compare them. We did have 4 German Shepherds at one time though. Life would be so lonely without a dog. I can't imagine it. Now...that's a great fortune. Only been without a dog for a short period. I can't imagine how lonely a life without dogs would be. HE was smarter and more talented than he realized. Thanks for dropping by the Bayou! That is one true fortune!!! And a delicious cookie! LOL! Great quote and post! This week, there fewer dogs in my office at work and I already feel like that's not enough dog time! How fun to have dogs at work though! I always just had human teenagers at my job. LOL! Uh oh...we don't have a dog here. Could we apply this to cats, too? Of course! Cats make your life purr-fect! Thank you, Kia! We agree with Vincent on this one. Thank you for visiting the Bayou. Thanks, JoAnn! I know your house and life are full of dog love! You know van Gogh missed out if he didn't have cats!